When I was a kid I loved field trips. That hasn’t changed, which is why I arrived at the RWA conference a couple of days early for the Kiss of Death chapter’s annual tour. Every year we see something different. In 2010 it was parachute riggers and NOAA storm chasers at MacDill AFB. Last year we visited the Coast Guard in New Jersey. 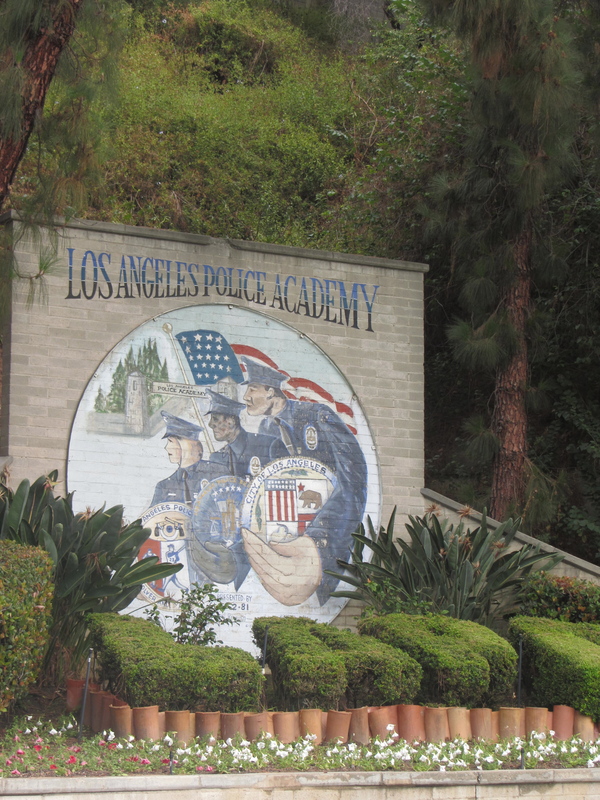 This year we got a glimpse into the workings of the Los Angeles Police Department (LAPD). It was sort of a mini Citizens Police Academy like the one I attended here in my county, but squeezed into one fun-filled day with 50 other writers of romantic mystery and suspense. We started our day at the Elysian Park facility, which is no longer used to train cadets, but is used for inservice training. Several units set up stations around a running track, happy to talk about their jobs and answer questions. My first visit was the mounted unit. 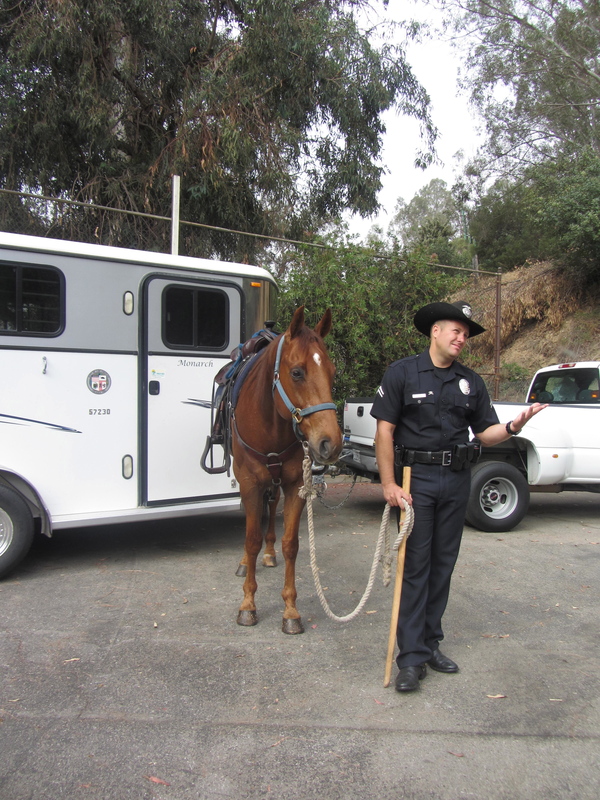 That’s right, the LAPD has horses! Part of the Metropolitan Division, the mounted officers provide crowd control for protests and large events, crime suppression, enforcement at public parks and beaches, and search and rescue support in the mountainous areas of L.A. The big wooden sword the officer in the photo is holding helps him keep people away from the horse (and himself) without causing unnecessary injury. My next stop was the K9 Platoon. Patrol dogs specialize in criminal apprehension. These are your German Shepherds and Belgian Malinois. They are let off the lead to pursue a criminal in a controlled area, and are trained to bite and hold the suspect. They don’t look for a particular person, but rather for any human in the area, though we were told that they’ve learned to go for the one who smells like fear. So, if you failed to hear the police when they broke down your front door, and you’re sitting in your back yard smoking crack with headphones on when your buddy runs outside to hide behind the shed, the dog will likely skip right by you and go for your partner in crime. The UDU has to tag and photograph evidence just like CSIs on dry land. 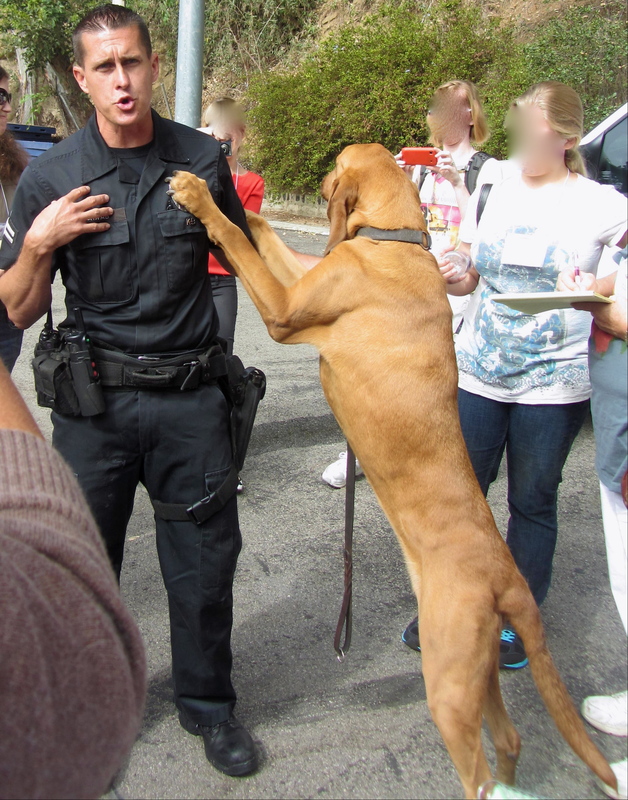 The LAPD uses bloodhounds for tracking and trailing. Tracking refers to following the path of the person, but not necessarily using their scent. Trailing is the process of following the specific scent of one person based on tissue and skin cells given off by that person, whether on the ground or in the air. Once given an uncontaminated scent-item belonging to the missing person—such as a piece of dirty laundry worn by them—the dog follows that trail to the exclusion of all other smells, tracking only when needed to pick up the scent again. Bloodhounds are kept on a lead, and their handler must have experience to know when the dog has lost the scent or found a weaker trail of it. According to the officer who spoke to us, it’s actually easier to follow a trail that has settled for about two hours than a fresh trail. That’s because the settled scent is stronger and less dispersed. Next up for me was the Underwater Dive Unit (UDU). Never having given any thought to such a team, I was fascinated by the concept of police divers and their mission. Working on call, much like SWAT, the divers are responsible for performing random underwater patrols of Los Angeles’ busy harbors, looking for smuggled items and people hidden on the hull of a ship—sometimes in welded-on boxes or in the air-tight well behind the propeller—in addition to explosive devices on ships or out on other structures in the harbor, such as pipelines. 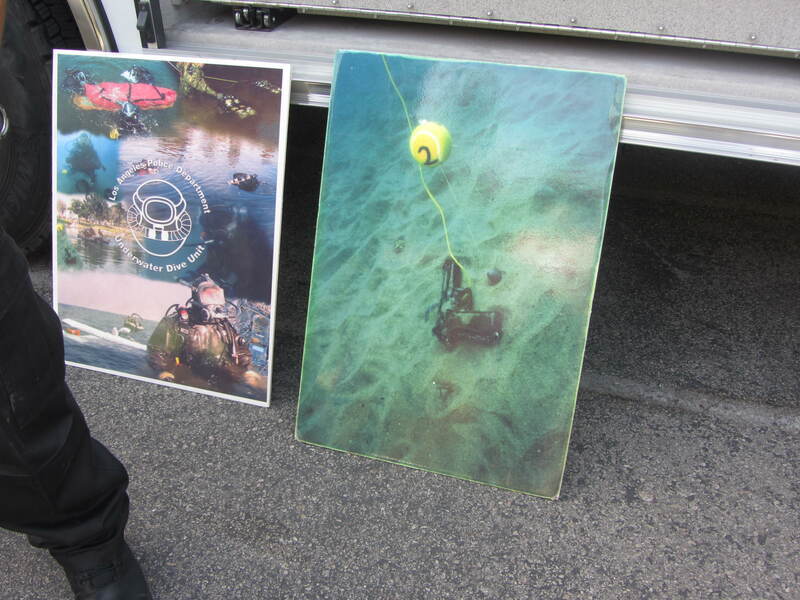 The UDU also performs underwater crime scene investigation, and evidence and body recovery. In addition to the ocean, they work in L.A.’s many lakes and reservoirs. Some of the waterways are contaminated, requiring divers to use a hazmat dry suit and mask instead of standard SCUBA gear. After the UDU, I got a glimpse of LAPD’s first and only female SWAT member and the big armored truck before rejoining the group for a quick history lecture and tour of the grounds behind the dining hall, which is part of the Los Angeles Police Revolver and Athletic Club (LAPRAAC). 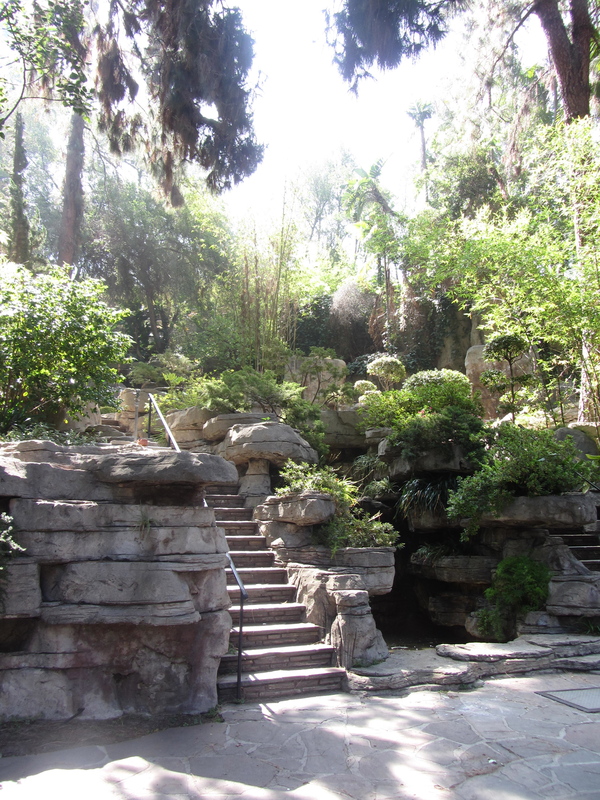 The outdoor area was designed by the same person who created the Disneyland’s Jungle Cruise, and is a beautiful oasis where weddings are apparently common. 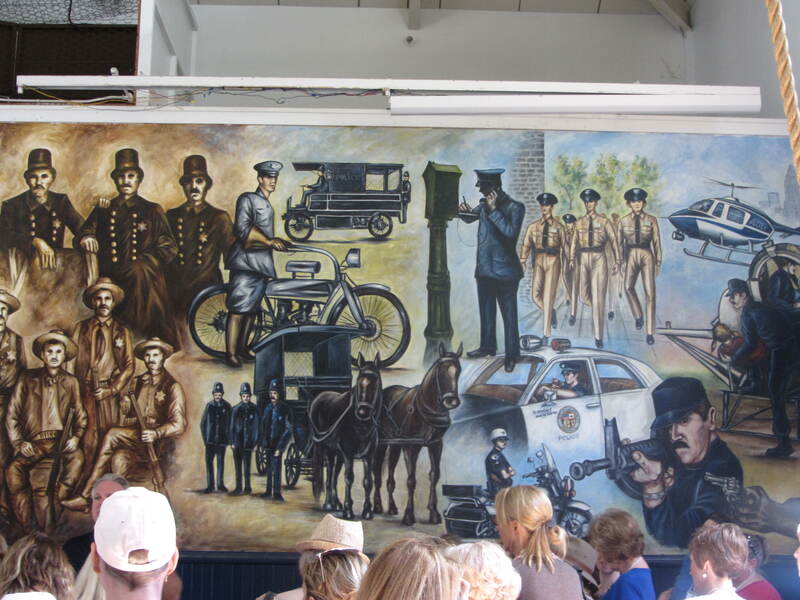 We followed that with a detour through the gym to see a mural representing the history of the LAPD, before eating lunch and hitting the gift shop for reminders of a great day. On Thursday I’ll tell you about our afternoon at the Davis Facility in San Fernando Valley. Thanks, Jolyse, it was a lot of fun! Now I’m doubly bummed I couldn’t go this year!! 🙁 I swear, Atlanta or bust! You definitely have to go to Atlanta, Maura! And the KOD tours are always worth it IMO.